Copyright © Celina Jonesi; all rights reserved; content may not be copied, rewritten, or republished without written permission. Posted July 29, 2013. Roof lanterns (skylights) are the simplest way of transforming a dull space into an airy, light, and attractive room you will want to spend most of your leisure time in. Long, narrow rooms as well as corridors, suffer often from lack of light and roof lanterns can serve as a natural solution. So why should you incorporate them into your home? They are frugal (illumination without electricity), and green (sunlight might not be renewable, but if you dont plan on living to 25,000 years, that shouldnt be an issue). 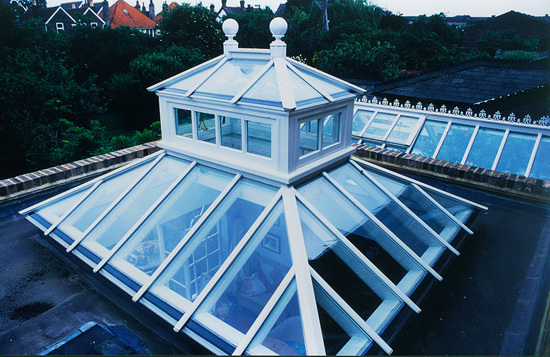 The history of roof lanterns can be traced back to early in the 16th century when they were a popular part of the structures known as Orangeries constructed in France and Italy. They were usually made of frames or bricks with large side glass windows along with a glass structure fitted on the flat roof for the purpose of additional natural light. They were constructed to cultivate oranges under controlled and favorable conditions. In the initial days, glass was manually manufactured and was very costly. Because of this, architects did not tend to make use of glass for roof lanterns while designing country houses for their rich clients. But, in the later part of Victorian era, machines began to be used for manufacturing glass and the the result was a quite reasonably priced product. At the same time, society witnessed a rise in the living standards of people, resulting in huge demand for glass for construction of houses. Many people started incorporating roof lanterns in their houses, educational institutions, hotels, public billiard rooms, dining areas, and kitchens. Unfortunately, in many cases these beautiful lanterns were prone to leak due to the drawbacks in the method of construction and sealing materials. These lanterns used a single glazing technique and allowed heat to escape during winter. In these lanterns of earlier times, ventilation was also required, and at times they were manually operated via a crank rod. In order to open or close the windows in these lanterns the rod was used. In the case of modern day skylights, installers and manufacturers utilize double glazing techniques, automatic electric mechanisms, and advanced sealing compounds in order to open or close the windows. These enhancements along with double glazed panels make sure that these windows maintain a timely appearance while offering durability and structural integrity with great insulating properties. They also make use of high quality durable hardwood timber and the micro-porous paints that ensure that they will last for a long time with minimum maintenance. Roof Lanterns are positioned in a way such that they flood the underlying room with dazzling light or illuminate a particular space in the house. They are suitable for every type of house and in particular, include highlighting the kitchen area or brightening up offices, gloomy stairwells, shops, and restaurants. The commercial use of these lanterns go beyond lighting up a particular area. They improve the appearance of any home dramatically and add value to our homes. They can also be used for generating more profit by making darker areas of an eating establishment, museum, or retail outlet more appealing. This can be important if you have a home-based business with a home office. They come in different sizes and you will definitely get the one of your choice. A well designed roof lantern, when executed in the right place of your home or any other ediface, can be a centerpiece and the talking point of your room. Unless you have solid carpentry and glazing skills, you are better off hiring a reliable contractor to do the job. A good place to find one is on Angies List. Use promo code SAVE25 to save 25%. Another thing to consider is your homeowners insurance policy. Update it as soon as the job is done and the city inspector signs off on it. Remember that your insurance policy covers the replacement cost of your home, not market value as a whole. Protect your investment and property equity. Website © 2011 KSmith Media, LLC; all Rights Reserved.